The term "ATV" was first coined to describe all terrain vehicles that were chiefly used by hunters, swamp agriculturists and the like. These vehicles were designed to run on land, across ponds and streams, through swamps and any other terrain the owner needed to traverse. Originally, these vehicles were 6-wheeled in the 70s, later to be marketed to weekend outing enthusiasts where they became, due to target pricing, incapable of water immersion, but perfectly suited for fun in sand and on boggy soil. Typically sporting 3 or 4 wheels at low pressure, ATVs are now commonplace. 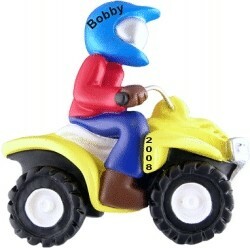 Our ATV ornaments make great memorabilia for youthful gift recipients who enjoy a good run on his or her ATV. 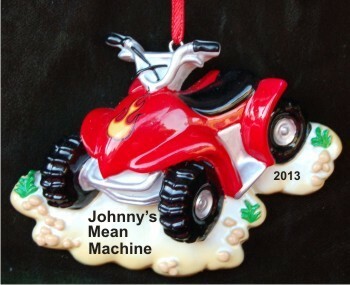 Personalize any ornament with their name and the year.